Clear, Red, Blue, Orange, Green, ect. For bulk order, logo printing, color option or shipping, please contact! 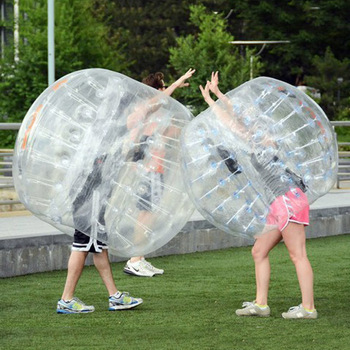 Bubble Football is a new craze sweeping the whole world. This is a fast moving sport which can be enjoyed by children and adults. Protected by big inflatable bubbles players try to play football with hilarious results. Take part or just watch as players bump into and knock each other over like human bumper cars while playing soccer. This game can be played on any open grass area, astroturf or indoor sports hall. Q: What are Bubble Balls made of? A: durable PVC or TPU Material, 0.8mm or 1.0mm thickness available. Q: Why TPU more expensive than PVC? Q: What happens if the ball punctures? A: The damage can easily be patched with repair kit (material patches and glue) included in the order. Q: Where can Bubble balls be used? • Specifically made arenas or pools for bubble balls. Q: Will you get injured inside Bubble ball? A: No. This is one of the safest fitness activities in the world, because you are safely protected by an air ball. 1. Air protection. 2. Handles to hold. 3. Safety Harness/Belts. Q: How to inflate bubble balls? A: The balls are inflated with air by an electric air pump. It takes about 90 seconds to inflate a ball. 2. Check the ball before using. Any damage, please mend it with our repair kit (material patches and glue). 4. Before packing, make sure the ball is clean and dry. Then store it in cool and dry place. 1. Find out exactly where the leak is. Fill a spray bottle with a mixture of soap and water and spray it liberally on the bubble ball along the seams. You will notice that the solution starts to bubble up where the leak is located, so take note of the position of the hole. 2. Prepare the hole for patching. Dry the seam off, and make sure that it is completely deflated before attempting to patch the seam. If you have the patch kit that came with the ball, you can use the prep solution to thoroughly clean the material (PVC or TPU) before proceeding. Rubbing alcohol also works. 3. Apply plumber's glue to the seam and let it dry for about 15 minutes. If possible, apply some glue to the inside of the seam as well, so that it spreads out and gives an extra layer of protection when the bubble ball pressurizes. 4. Fill the bubble ball about halfway with air and wait another 30 minutes or so to make sure that the glue has dried completely. 5. Inflate the item completely and spray it again with the soap and water mixture to make sure that the hole is indeed fixed. 1. Custom Designs available for logo printings, strings, handles, harness, buckles, valves. 2. Material: Durable PVC or TPU, 0.8mm or 1.0mm thickness. Abrasion Resistance, Outstanding Flexibility, Lead free, Waterproof, Fireproof, Waterproof. 3. Professional Machines for Cutting, Welding and Printing to ensure high quality. 6. Air Pumps are CE, UL and GS approved in 110v-120v or 220v-240v with various kinds of plugs, US$30 per each. 8. Strong packing bag and export carton for transport and reuse. 10. Payment: 30% deposit, by T/T (telegraphic transfer), L/C, Western Union, Money Gram, Pay.pal, etc.